Dragon fruit comes from a type of climbing cacti. Multiple types of dragon fruit are cultivated, so it can easily be found in a variety of shapes, sizes and colors. Different types of dragon fruit have different nutritional values. However, their flavor is generally the same, and most types of dragon fruit can be used in similar ways. Dragon fruit traditionally has a round or bell-shaped appearance and bright, reddish-pink skin that flares out. It's also available in violet- and yellow-skinned varieties. On average, a dragon fruit weighs about 300 to 600 grams (10.5 to 21 ounces). Dragon fruit is considered to be a fairly refreshing fruit with a sweet or mildly tart flavor. It can be easily eaten on its own, used in a fruit salad or added a smoothie. It is also increasingly in demand as a component of desserts, whether this is in the form of sorbets or candies. The pulp of the fruit is filled with tiny black seeds that can be eaten along with the fruit or isolated and turned into oil. As you might imagine, different types of dragon fruit have different nutritional values. Two of the most commonly consumed types of dragon fruit are Hylocereus undatus and Hylocereus polyrhizus. Red-colored dragon fruits such as these are rich in antioxidants, and all dragon fruits have seeds that are rich in essential fatty acids. The oil from these seeds is a better source of linoleic acid than other common oils, including sesame, flaxseed and rapeseed oils. It also has trace amounts of other nutrients, like B-complex vitamins and vitamins A and C as well as calcium and iron. The USDA doesn't specify the type of dragon fruit that is detailed in its nutritional analysis. The world's current leading exporter of dragon fruit is Vietnam, but dragon fruit is so extensively cultivated that it can come from just about any continent. You should be aware that dragon fruit nutrition can vary widely. 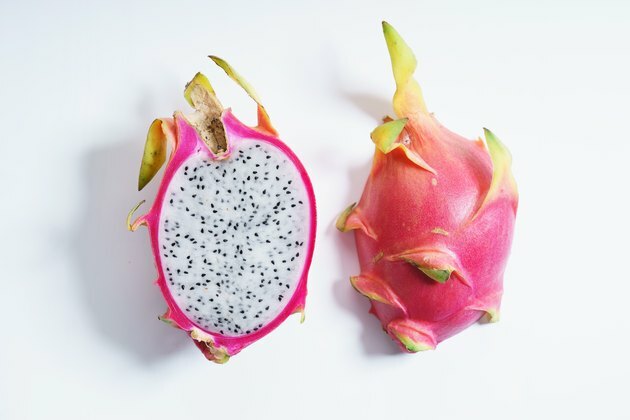 According to a 2014 study in the International Food Research Journal, the nutrition of dragon fruit can differ substantially simply based on where it is grown or even between dragon fruits of the same type. Besides the location, other factors have been found to affect dragon fruit nutrition. These factors include the season when it is grown, the climate where it is grown, the agricultural practices used during cultivation, and the way the fruit is handled and stored after it is harvested. Although dragon fruit is delicious, its nutrition can have quite a lot of variety. Read more: Should You Eat Fruits & Veggies Raw or Cooked? Dragon fruit has become increasingly popular around the world and thus is grown in a variety of subtropical and tropical climates, including Central America, South America and Southeast Asia. While this fruit is extensively cultivated in places like Vietnam, Thailand, Indonesia and Australia, it's also grown in many other parts of the world, from the Caribbean to Hawaii. Depending on whether dragon fruit is grown in Australia or Malaysia, its calorie content per 100 grams may range from 36 to 63 calories. Similarly, the carbohydrate content of dragon fruit can range from 8.5 to 13 grams, respectively. Both the Australia- and Malaysia-grown dragon fruits are of the same type, with pink skin and red pulp. The only difference is their country of origin. Malaysian dragon fruit also contains trace amounts of iron, potassium, zinc, calcium and vitamins A and C. As you can see, the nutrition stats provided in the USDA listing are more similar to those of the Malaysian dragon fruit. However, many of these benefits haven't been studied well. The primary benefits of dragon fruit seem that it is rich in antioxidants and filled with oligosaccharides that allow it to act as a prebiotic. Its effects on the gastrointestinal system are undoubtedly positive since your gut and brain are connected. The health of your gastrointestinal system can affect many aspects of your body, influencing everything from your energy levels to your mental health. What is the Nutritional Value of Black Seed Oil? How Many Calories Does an ICEE Have?